Studio Line: Criterion - The music that thrilled the world ... and the killing that stunned it! DVD: Fullscreen 1.33:1; audio English DD & DTS 5.1, English Dolby Digital Stereo 2.0; subtitles English; closed-captioned; single sided - double layered; 27 chapters; rated NR; 91 min. ; $39.95; street date 11/14/00. Supplements: Audio Commentary from Directors Albert Maysles and Charlotte Zwerin and Collaborator Stanley Goldstein; Outtakes of Rolling Stones Performances of “Little Queenie”, “Carol”, and “Prodigal Son” Plus Back-Stage Footage; Excerpts from KSAN Radio’s Altamont Wrap-up; Altamont Stills Gallery; Trailers; Filmographies; Restoration Demonstration; “The Rolling Stones, Altamont and Gimme Shelter” 44-page Booklet. Though only three years had passed since their last American concert tour, the world that confronted the Rolling Stones in 1969 was substantially different than the one that existed in 1966. For one, their audiences in 1966 still mainly consisted of screaming teeny-boppers; performances had little to do with music since few could actually hear what the band played. By 1969, the teeny-bopper aspect had disappeared and rock music had reached a much higher level of critical acceptance. Personally, I disagree with those who feel the music “matured” in that period since the Beatles released 1967’s “Sgt. Pepper’s Lonely Hearts Club Band”, as I find much of that band’s output from 1963 through 1966 to be superior to the “classic” albums they later produced, but the fact remains that due to such works, the genre changed from teen-oriented “noise” to more sophisticated and well-regarded material. The Stones showed much greater progress in this regard. As far as I’m concerned, the Beatles changed between 1963-64 and the end of the decade, but it remains arguable whether or not they improved. The same case cannot be made for the differences in the Stones’ work. Early albums like “England’s Greatest Hitmakers” and “12X5” consisted mainly of covers of blues songs with very few original songs. Ironically, one of the Stones’ first hits was the Lennon-McCartney penned “I Wanna Be Your Man”; also sung by Ringo on “With the Beatles”, John and Paul specifically composed the tune for the Stones. By the time of 1965’s “Out of Our Heads”, the Stones had started to emerge as more of a creative force. That album featured the song that remains their most famous: “(I Can’t Get No) Satisfaction”. It also included a few covers, but for the first time, a Stones album consisted mainly of original numbers. The band’s true breakthrough wouldn’t occur for another year, however, with 1966’s excellent “Aftermath”. For the first time, the Stones released an album that could truly stand with the best records produced by the Beatles, as “Aftermath” produced a roster of consistently fine songs, all of which were Jagger/Richards compositions. “Aftermath” remains one of their five best albums. Following “Aftermath”, the Stones put out the solid though not quite as good “Between the Buttons” in early 1967. The Stones always took some cues from the Beatles, so it’s not a surprise that their next album - late 1967’s “Their Satanic Majesties’ Request” - was a semi-psychedelic piece that tried to outdo “Sgt. Pepper’s”. Despite my reservations about the latter album, “TSMR” never came close to the level of the Beatles' piece; it featured a couple of good tunes like “2000 Light Years From Home” and “She’s a Rainbow”, but it seemed clear that the Stones’ scruffy hearts weren’t in this half-assed hippie drivel. The violent upheaval of 1968 fit the Stones much better, and their work demonstrated this. From the excellent single “Jumpin’ Jack Flash” to the entirety of their sole album that year, “Beggar’s Banquet”, it was clear that the Stones were finally reaching full musical maturity. The album featured well-known classics like “Sympathy for the Devil”, “No Expectations” and “Street Fighting Man” plus gems like “Salt of the Earth” and “Stray Cat Blues”. Even better was 1969’s follow-up, “Let It Bleed”. Although it should have been a transitional album - the record marked the final appearances of founding member Brian Jones, who was booted from the band in mid-1969 and died soon thereafter - it actually could be regarded as the Stones’ best work. It also mixes famous tunes like “You Can’t Always Get What You Want”, “Midnight Rambler” and “Gimme Shelter” plus a slew of killer songs like “Live With Me”, “You Got the Silver”, “Monkey Man” and “Let It Bleed”. Leave off the silly “Country Honk” - a Southern remake of “Honky Tonk Women” - and you have a virtually perfect album; only perhaps 1972’s “Exile on Main Street” stands as a superior Stones release. As such, this meant that the Stones were truly riding high as they began their first American tour in three years. That time period is nothing nowadays - the band went eight years between tours in the Eighties - but seemed like an eternity in the Sixties; after all, that was an era in which performers used to release more than one album a year as opposed to the three or four years between records typical for today’s stars. 1969 was a time in which the Stones were ripe to become the true kings of rock. The Beatles were essentially finished by the end of that year, though the plug wouldn’t finally be pulled until April 1970. I can’t say how obvious it was to the residents of that era that the Beatles really would never come together again, but the stage seemed set for the Stones nonetheless, and their triumphant return to the stage gave them a terrific opportunity to claim their crowns. For the most part, all went as planned. Sell-out crowds greeted them with enthusiasm and respect not accorded on prior tours, and the band never sounded better; with the killer roster of tunes recorded since the last tour at their disposal, the set lists were tremendously solid and the Stones provided versions that regularly surpassed the studio renditions. As a capper to this successful trek, the Stones decided to play a free festival in California as a “thank you” to their fans. Actually, the show was partially to make up for an apparent error in judgment; though invited to play, they skipped the prior summer’s festival at Woodstock and they seemed to want to regain some credibility through their own similar excursion. A few other acts like the Jefferson Airplane and the Grateful Dead were recruited to perform as well, and the Stones planned their own “Woodstock West”. The show went through a variety of venue changes but ultimately ended up at a speedway in northern California. The location was named Altamont, and that title would soon enter the ranks of rock infamy, as succinctly detailed in Gimme Shelter, the excellent documentary about the Stones’ 1969 tour. To say that the concert didn’t go as planned is an understatement, and the movie clearly details all of the problems that occurred. It was a haphazard set-up that suffered from too much naiveté and not enough legwork. I guess in the hippie-drippy world of the late Sixties, everyone put faith that all would end well and didn’t expend much energy into planning and preparation. Then as now, that’s a recipe for disaster, as the events at Altamont would prove. To be fair, Woodstock really wasn’t much better run than Altamont, but the excesses were less overt at the former event. Due to a misunderstanding, the Stones took on the Hell’s Angels as a security corps, and that’s where things really went wrong. However, clouds hung over the concert from the start, as we see in Gimme Shelter. The film shows just how doomed the event was from virtually the initial thoughts, and clearly depicts the problems as they occurred. When Jagger steps off the helicopter and immediately - and bizarrely - is punched by some moron, you just want to see him hop back on the chopper and leave, because it’s clear this story won’t have a happy ending. GS doesn’t wallow in the misery, but the events of Altamont pervade the film. Much of the movie shows concert footage from the majority of the tour, but these scenes are intercut with scenes of both the preparation for Altamont and shots of band members as they view the filmed material after completion of the tour. There are also some good bits of the band on the road and in the studio; Stones fans will be fascinated to hear a raw mix of “Wild Horses”, for example. But even through the highs of the Stones’ excellent performances we still see the approaching storm clouds, and when the melee occurs, the movie reaches a higher level. GS depicts the events of December 6 1969 - another date that would live in infamy - with clarity and a strong level of objectivity but it also creates a palpable sense of tension and unrest. From events that are comic - such as a well-meaning middle aged white woman who espouses civil rights with some less-than-politically-correct statements - to downright spooky - like the many shots of disturbed Angels - the makers of GS somehow managed to have their cameras in all of the right locations. When the volcano really erupts, we see what happened in all its scary clarity. Without the events of Altamont, Gimme Shelter would have been a solid documentary; a band like the Stones couldn’t help but be interesting, especially during such a tumultuous time period. However, the nightmare of Altamont added an additional layer of powerful footage that takes the film from the level of compelling documentary to classic. It’s a movie that shouldn’t be missed; even if you aren’t very interested in the Stones, the picture stands as a strong piece of work. Gimme Shelter appears in its original theatrical aspect ratio of approximately 1.33:1 on this single-sided, double-layered DVD; due to those dimensions, the image has not been enhanced for 16X9 televisions. For what it is - an inexpensively-made documentary from more than 30 years ago - Gimme Shelter really looks quite good, but from an objective point of view, it contains enough flaws to warrant a grade no higher than a “C”. Focus was a major concern during the film. Notice that I didn’t criticize “sharpness” per se, because that wasn’t the problem. Instead, virtually all of the issues related to blurriness stemmed from the camerawork. Because of the manner in which the movie was filmed, a lot of shots took a few seconds to get into focus. I don’t have any problem with this style; it results from a desire by the filmmakers to concentrate on the most compelling material, technical problems be damned. Nonetheless, it does mean that an unusually large portion of the movie appeared out of focus. Noticeable differences in quality also occurred between the scenes shot indoors - most of which showed various members of the Stones (usually Mick and Charlie) as they watched footage - and those filmed at concerts. The latter tended to look better, which seems surprising since the situations were less controlled. Nonetheless, I preferred the appearance of the concert shots. Perhaps the lowered lighting hid some of the flaws more effectively, as the non-concert scenes showed a greater prevalence of print flaws. Grain was easily noticeable throughout the whole film but seemed especially heavy during the non-concert segments. Other print defects were surprisingly absent. I saw only minor examples of grit and speckles plus a few small hairs, and the only additional substantial issue I noticed other than grain came from some persistent thin vertical lines observed during “Love In Vain”; Criterion did a nice job of cleaning up this film. As a whole, I definitely preferred the look of the concert scenes. The colors appeared brighter and more vivid; the reds of clothes and blues of outfits and Bill Wyman’s bass came through with reasonable accuracy, though colored lighting could seem a bit heavy at times. Blacks were fairly solid and deep, but shadow detail was somewhat heavy. Since the filmmakers couldn’t control for lighting, this wasn’t a surprise, and the movie handled the problem fairly well. The interior scenes came across as more problematic in general. They seemed softer above and beyond the focus concerns; these segments were somewhat flat and bland for the most part. Colors appeared drab and lifeless, and blacks followed suit. Honestly, I feel guilty for criticizing so much of the appearance of GS, since I’ve seen prior video incarnations of the film and know that this one is a marked improvement upon them. However, it still has a lot of concerns, virtually all of which aren’t ever going to disappear. Criterion get high marks for the effort put into the movie but it still only receives a “C” for picture simply because it has a number of visual problems. A much happier story greets us when we examine the soundtrack of Gimme Shelter. The film has received sparkling new 5.1 remixes and it sounds quite good, at least during the concert segments. GS features both DTS and Dolby Digital 5.1 tracks. I preferred the DTS version and will discuss it first; a final paragraph will summarize the ways in which I thought the DD edition differed from the DTS mix. All of the sonic improvements concerned the concert scenes. The audio for other segments appeared largely monaural, though some mild directional effects appeared; for example, a helicopter panned from center to right at one point. However, that kind of manipulation was fairly rare, and the non-concert parts usually stuck closely to the center channel. The audio quality of those scenes also seemed pretty unspectacular but it was in keeping with similar efforts of the era. Dialogue and effects appeared clear and acceptably distinct but were fairly flat and thin. There’s not a whole lot of life to the sound in those segments. On the other hand, the concert pieces were a completely different story. The music jumped to life quite effectively and provided very clear and vibrant sound. The stereo separation seemed excellent, as the guitars split nicely between the side channels and the entire package created a very three-dimensional image. No particular music came from the rears, but the surrounds bolstered the songs in such a way that I felt effectively engulfed by the songs. Otherwise the rears stuck to crowd noise. It’s a fine mix that really made the concert scenes vivid and lively. Quality seemed very strong, though some variations occurred. At times the mix hit a few flat spots where Charlie’s cymbals may lose some sizzle or the guitars may wobble slightly, but these were fairly rare and clearly resulted from imperfections in the source material. Mick’s vocals occasionally were a little edgy as well, but as a whole, the music sounded bold and crisp. The track also boasted fine bass, and the dynamics seemed excellent. The Altamont scenes displayed somewhat weaker music than the earlier segments. In particular, the guitars appeared fuzzier and more distorted. This edginess isn’t terrible, especially since a little rasp doesn’t really hurt this kind of music, but I did find the Altamont audio to appear less clear and clean. As a whole, the Dolby Digital track didn’t differ substantially from the DTS mix, but I thought the latter came across as more rich and full during the concert scenes. The DD version lacked bass that appeared as deep and tight, and the spread of the music was better integrated and more encompassing in the DTS track. Ironically, though the DTS mix seemed better defined, imperfections were less clear when I listened to it. For example, some distortion occurred during “Honky Tonk Women” but it appeared more prominent in the DD version. Frankly, the differences between the two tracks were petty minor, but I preferred the DTS edition and will stick with it in the future. Gimme Shelter includes a slew of nice supplemental features, starting with an audio commentary from directors Albert Maysles and Charlotte Zwerin plus collaborator Stanley Goldstein. As is typical of Criterion’s commentaries, all of the participants were recorded separately and their remarks later edited together. Some dislike this kind of track since it’s not as spontaneous and “screen-specific”, but I prefer it since the results are almost always more coherent and tight. That’s the case here as Criterion have created another terrific commentary. The participants provide a vivid picture of the creation of the film and show no qualms about offering frank details about the various concerns. A variety of issues are covered, but inevitably most of them relate to Altamont. Although that focus might seem a little more narrow than is necessary, and I honestly would have liked to hear more of their impressions of the Stones in general, the comments are uniformly compelling and informative; it’s a great addition to the film. Next we find some new concert footage from the Madison Square Garden shows. In these 22 minutes and 20 seconds of “Outtakes”, we find performances of Chuck Berry’s “Little Queenie” and “Carol” (misidentified as “Oh Carol” by Criterion), plus the Reverend Robert Wilkins’ “Prodigal Son”. In addition to the live shots, we also see Mick and Keith as they mix “Little Queenie” and also as they mingle and play backstage with Ike and Tina Turner. All of the clips are presented with only monaural sound, unfortunately, and the picture quality is rougher than what we see in the finished film, but I’m still very happy to have this addition. Another section provides about 69 minutes of excerpts from the “KSAN Radio Broadcast” the day after the Altamont show. Hosted by disc jockey Stefan Ponek - who also gives new introductions to the different subjects - we hear a broad overview of the day’s activities, with the obvious focus on the problems. Included in the participants are Stones’ road manager Sam Cutler and two Hell’s Angels. You can take in each of 12 different chapters individually or play the whole thing as one. It’s a solid piece that made for great listening. At the end of that area, we find a “bonus”: audio footage of the Stones pre-tour press conference at New York’s Rainbow Room. Although all five members were present, almost all of the questions are aimed at Jagger. This segment lasts 20 minutes and is interesting, though the conference is too chaotic for it to make much sense. “Images from Altamont” contains pictures taken by two different photographers: Bill Owens and Beth Sunflower. In Owens’ section we find 57 shots, while Sunflower’s area includes 31 snaps. These focus on the crowd but mix in a lot of good images of the bands as well. They also provoke the eternal question: why is it only fat and unattractive people go naked at concerts? In “Maysles Film Trailers” we get a slew of promos for their movies. 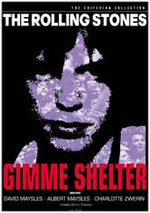 There are two ads for the original theatrical release of Gimme Shelter plus one for its 2000 re-release. In addition, we find trailers for two other films of theirs: 1968’s Salesman and 1976’s Grey Gardens. Another area provides filmographies for both the Maysles and Charlotte Zwerin. Some still images follow each of the two filmographies. The four minute and five second “Restoration Demonstration” shows how Criterion created the new audio and picture of the film. Frankly, I’ve always found these pieces to seem somewhat self-congratulatory, but it nonetheless offers an interesting comparison between old and new transfers. Criterion usually include some solid essays in their booklets, but for Gimme Shelter they’ve really outdone themselves. Called “The Rolling Stones, Altamont and Gimme Shelter, this 44-page text includes writings from Mick’s former assistant Georgia Bergman, music writers Michael Lydon and Stanley Booth (who has written a few different books about the band), film critics Amy Taubin and Godfrey Cheshire, and Sonny Barger, the Hell’s Angel who headed the Oakland chapter at the time of Altamont. Of that group, I most enjoyed the pieces from Booth and Lydon. They provided the most coherent examination of the events and also featured the most interesting additional information. However, all of the articles merit examination, as each includes material that added to my knowledge of the film and the era depicted. Altamont remains one of the most ambiguous tragedies documented; even after more than 30 years, it seems impossible to truly mete out the lion’s share of the blame to any single party. Some want to pin it on the Stones, some on the crowd, some on the Hell’s Angels, but none of them alone were responsible. Whatever preconceptions one may have about the events of December 6 1969 may not last after you watch Gimme Shelter, a film that documents part of the Stones’ American tour but which mainly focuses on Altamont. The movie displays the actions objectively and unambiguously but makes no moral judgments; it simply presents the evidence and leaves the viewer to decide. The DVD offers relatively positive picture plus a fine new audio mix and some terrific supplements. After more than three decades, Gimme Shelter retains the power it possessed on the day of its release, and it comes highly recommended.